The Mayor of St Helens Councillor Geoff Almond visited Rainford Tennis Club today to see the new tennis courts being built at the Jubilee Recreation Ground. 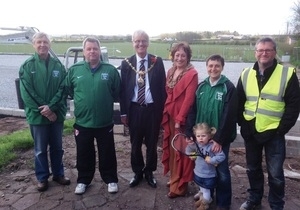 The Mayor is pictured (right) meeting representatives of Rainford Tennis Club, project managers Trident Building Consultancy and the contractors, Doe Sports, who updated on the progress of the building of the new tennis courts in Rainford, which will be completed in June. The three new porous macadam courts are being built, with funding from the LTA and Sport England’s Inspired Facilities, to help Rainford Tennis Club achieve its aims of getting as many people as possible from the local community and surrounding areas to play the sport of tennis. “We are delighted to welcome The Worshipful the Mayor of St Helens, Canon Councillor Geoff Almond to Rainford Tennis Club today” said Club Chairperson, Helen Bligh.